Akhilavijnanakosam Malayalam Encyclopedia — D C Books Multimedia Series. ↑ K. C. Sivaramakrishnan (2006). People's Participation in Urban Governance. Concept Publishing Company. पृ॰ 156. आई॰ऍस॰बी॰ऍन॰ 81-8069-326-0. ↑ Ganesh Kumar. Modern General Knowledge. Upkar Prakashan. पृ॰ 194. आई॰ऍस॰बी॰ऍन॰ 81-7482-180-5. ↑ "GCDA - Greater Cochin Development Authority". Gcdaonline.com. अभिगमन तिथि 12 November 2012. ↑ "Provisional Figures, Kerala" (PDF). Office of The Registrar General & Census Commissioner. अभिगमन तिथि 7 April 2011. ↑ "Provisional Population Totals, Census of India 2011" (PDF). Census of India. अभिगमन तिथि 11 March 2011. ↑ अ आ "Ernakulam_History". अभिगमन तिथि 5 April 2015. ↑ "PowerPoint Presentation" (PDF). अभिगमन तिथि 12 November 2012. ↑ "Steps to control pollution in Greater Kochi area mooted". द हिन्दू. 20 September 2010. ↑ "GCDA - Greater Cochin Development Authority". अभिगमन तिथि 5 April 2015. ↑ अ आ "Tourist statistics – 2008" (PDF). Government of Kerala, Tourism Department. अभिगमन तिथि 22 October 2010. ↑ "Urban world: Mapping the economic power of cities 2011". McKinsey Global Institute. अभिगमन तिथि 3 February 2013. ↑ "Indian Coast Guard. Regions. Western Region". Indiancoastguard.nic.in. अभिगमन तिथि 12 November 2012. ↑ "Indian Coast Guard. Organization Structure". Indiancoastguard.nic.in. अभिगमन तिथि 12 November 2012. ↑ "Indian Coast Guard. Aviation". Indiancoastguard.nic.in. अभिगमन तिथि 12 November 2012. ↑ "Kochi Refinery Overview". Bharatpetroleum.com. अभिगमन तिथि 12 November 2012. ↑ "Kochi Refinery Projects". Bharatpetroleum.com. अभिगमन तिथि 12 November 2012. ↑ "HOCL official web site. Phenol Complex at Kochi in Kerala". Hocl.gov.in. अभिगमन तिथि 12 November 2012. ↑ "TELK official website". Telk.com. अभिगमन तिथि 12 November 2012. ↑ "Facts about India" (PDF). Corporation of Cochin. अभिगमन तिथि 9 January 2010. ↑ "Fort And Harbour". Cghearth.com. अभिगमन तिथि 12 November 2012. ↑ अ आ इ ई उ ऊ C. M. Dinesh Mani, Mayor(2000–2005). "Cochin" (PDF). Cochin (A Monograph). Corporation of Kochi. अभिगमन तिथि 11 October 2010. ↑ "History of Ernakulam". Ernakulam Portal. राष्ट्रीय सूचना-विज्ञान केन्द्र. अभिगमन तिथि 23 May 2006. ↑ "History of Kochi Rajas". Centre For Heritage Studies. अभिगमन तिथि 12 March 2009. ↑ "Accounts of Nicolo de' Conti (ca.1395–1469)". Niccolo di Conti. win.tue.nl. अभिगमन तिथि 23 May 2006. ↑ "Kochi, भारत". Encyclopædia Britannica. अभिगमन तिथि 9 March 2011. ↑ "Early Voyages to the Far East". University of Calgary. अभिगमन तिथि 9 March 2011. ↑ The Fourth Tour of His Excellency Sir Arthur Lawley to Cochin and Travancore - 25 January to 14 February 1907. Madras Government Press. ↑ Letter from Lord Wenlock to his wife Constance, 29 January 1907. Hull University. Forbes Adam Archive. ↑ "Facts about India". भारत सरकार. अभिगमन तिथि 9 January 2010. 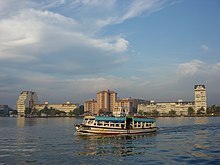 ↑ "Cochin Harbour and Willingdon Island". Official website of Ernakulam District. केरल सरकार. अभिगमन तिथि 21 August 2006. ↑ अ आ "Statistical data". Govt. of Kerala. अभिगमन तिथि 22 August 2006. ↑ "Kochi forward for Metro status". The New Indian Express. अभिगमन तिथि 5 April 2015. ↑ "Metro status eludes Kochi as government drags its feet". द हिन्दू. 13 April 2013. ↑ अ आ "Ever recorded Maximum and minimum temperatures up to 2010" (पीडीएफ़). भारतीय मौसम विभाग. अभिगमन तिथि अप्रैल ११, २०१५. ↑ अ आ "कोच्चि जलवायु सारणी अवधि: १९७१-२०००". भारतीय मौसम विभाग. अभिगमन तिथि अप्रैल ११, २०१५. ↑ "Corporation of Cochin, Division Map" (PDF). Corporation of cochin. अभिगमन तिथि 3 November 2010. ↑ "Private firm allowed to draw Periyar water". द हिन्दू. 9 September 2003. अभिगमन तिथि 22 August 2006. ↑ "Organisational chart". Kochi City Police. अभिगमन तिथि 22 August 2006. ↑ Radhakrishnan, S. Anil (28 October 2011). "Alarming crime rate in Kochi". द हिन्दू. ↑ "Crime yes, but no Capital- Kochi- IBNLive". Ibnlive.in.com. 29 October 2011. अभिगमन तिथि 12 November 2012. ↑ Haridas, Anand (30 October 2011). "Kochi city police 'set record straight'". द हिन्दू. ↑ "Google Search, "kerala commecial capital"". Google Search. अभिगमन तिथि 15 October 2010. ↑ Our Bureau. "SEBI opens office in Kochi". द हिन्दू बिज़नस लाइन. अभिगमन तिथि 5 April 2015. ↑ George Joseph (10 June 2005). "Check out how Kochi is shining!". रीडिफ.कॉम. अभिगमन तिथि 6 January 2006. ↑ Staff Reporter (20 January 2009). "Rs.620-crore rise in revenue collection in Ernakulam district". द हिन्दू. अभिगमन तिथि 1 March 2009. ↑ Staff Reporter (23 December 2012). "Government starves the golden goose". द हिन्दू. अभिगमन तिथि 21 January 2013. ↑ "Kerala Planning Board, Economic Review 2008–09, App 3.13" (PDF). District-wise Distribution of GSDP. Government of Kerala. अभिगमन तिथि 12 October 2010. ↑ "Doing Business in India 2009" (PDF). World Bank. अभिगमन तिथि 8 June 2010. ↑ Director, Kerala Tourism. "Kerala, Gods Own Country — Where Business Blooms". cbcglobelink.org. मूल से 23 July 2006 को पुरालेखित. अभिगमन तिथि 7 February 2006. ↑ CNN-IBN (27 June 2006). "Toxic curse for Kerala chemical city". IBNLive.com. अभिगमन तिथि 25 August 2009. ↑ Money Control. "Fertilisers and Chemicals Travancore". Money Control. अभिगमन तिथि 2 October 2010. ↑ "India: Gorgon to Supply Petronet's Kochi LNG Terminal". LNG World News. 15 June 2010. अभिगमन तिथि 14 October 2010. ↑ "Cochin Port Trust, the Cruise Destination". Cochin Port Trust. अभिगमन तिथि 3 November 2010. ↑ "Kochi marina set to start operations". Business-standard.com. 19 April 2010. अभिगमन तिथि 14 October 2010. ↑ "Southern Naval Command". Bharat Rakshak. मूल से 25 August 2006 को पुरालेखित. अभिगमन तिथि 29 August 2006. ↑ "List of ship building centres in India". Shipping Ministry of India. मूल से 15 September 2005 को पुरालेखित. अभिगमन तिथि 23 May 2006. ↑ "CPT hands over land for marina". द हिन्दू. 26 August 2005. अभिगमन तिथि 23 May 2006. ↑ "The first cruise terminal in the country to come up in Kochi". द हिन्दू. 30 June 2007. अभिगमन तिथि 29 August 2007. ↑ "Kochi terminal handed over to Dubai Ports International". द हिन्दू. 2 April 2005. अभिगमन तिथि 23 May 2006. ↑ "Vallarpadam phase I by early 2009: DP World". द हिन्दू. 2 April 2005. अभिगमन तिथि 23 May 2006. ↑ "Vallarpadam ICTT: Set to make Kochi a key hub". द हिन्दू बिज़्नेस लाइन. 27 October 2008. अभिगमन तिथि 14 November 2008. ↑ "Statement by the Government of India" (PDF). प्रेस इन्फ़ॉर्मेशन ब्यूरो, भारत सरकार. 27 October 2008. मूल (PDF) से 25 February 2009 को पुरालेखित. अभिगमन तिथि 14 November 2008. ↑ "Cochin Port Trust" (PDF). ↑ "Kochi, the next electronic city". Kochi, the next electronic city. The New Indian Express. 31 August 2010. अभिगमन तिथि 11 October 2010. ↑ The Hindu Business Line, 9 July 2010. "Kochi, the next electronic city". NeST Electronics City in Kochi soon. The Hindu. अभिगमन तिथि 11 October 2010. ↑ The Hindu (5 June 2008). "CIAL presents 'Aerotropolis' roadmap". The Hindu. अभिगमन तिथि 28 February 2009. ↑ The Hindu (5 June 2008). "Kochi airport presents 'Aerotropolis' roadmap". The Hindu. अभिगमन तिथि 28 February 2009. ↑ "कोचीन अन्तर्राष्ट्रीय विमानक्षेत्र का आधिकारिक जालस्थल". Cochin-airport.in. अभिगमन तिथि १४ अक्तूबर २०१०. ↑ "A novel venture in the history of Indian Aviation". कोचीन अन्तर्राष्ट्रीय विमानक्षेत्र. अभिगमन तिथि 23 May 2006. ↑ "CIAL Technical Information". Airports Authority of India. अभिगमन तिथि 13 October 2010. ↑ "NS&EW Corridor Map". National Highway Authority of India. अभिगमन तिथि 24 January 2011. ↑ "NS&EW Corridor Chainage Chart". National Highway Authority of India. अभिगमन तिथि 24 January 2011. ↑ "A mammoth task achieved". The Hindu. 11 February 2011. अभिगमन तिथि 22 March 2011. ↑ "State Highways in Kerala". अभिगमन तिथि 17 November 2010. ↑ "Ring roads for Kochi city". MyDreamHouse.in. 17 February 2012. अभिगमन तिथि 12 November 2012. ↑ "Kochi Municipal Corporation – Urban Knowledge Base" (PDF). Kochi Municipal Corporation. अभिगमन तिथि 25 October 2010. ↑ "Ernakulam Junction (South)/ERS Railway Station – Today's Train Arrival Timings – All Trains – India Rail Info – Database of Indian Railways Trains & Stations". India Rail Info. 19 June 2010. अभिगमन तिथि 14 October 2010. ↑ "Cochin State Railways". Irfca.org. अभिगमन तिथि 12 November 2012. ↑ "Metro Stations". Kochi Metro Rail Ltd. अभिगमन तिथि 24 February 2012. ↑ "Trade with India—major ports in India". National Informatics Centre. मूल से 15 December 2006 को पुरालेखित. अभिगमन तिथि 23 May 2006. ↑ Gopal, Madan (1990). K.S. Gautam, संपा॰. India through the ages. Publication Division, Ministry of Information and Broadcasting, Government of India. पृ॰ 177. ↑ "धार्मिक आंकड़े". सेन्सस इण्डिया – हाउसहोल्ड व्हिज़मैप. भारत की जनगणना. अभिगमन तिथि २३ मई २००६. ↑ अ आ "Jain Temples, Kerala". Jainsamaj. अभिगमन तिथि 1 March 2011. ↑ अ आ "Jain Temple turns 100". The Hindu. 25 November 2004. अभिगमन तिथि 1 March 2011. ↑ अ आ "Gurudwara in Kochi". All about Sikhs. अभिगमन तिथि 1 March 2011. ↑ Institute of Competitiveness (12 December 2011). "Liveability Index 2011, The Best Cities in India" (PDF). IFC. अभिगमन तिथि 11 July 2012. ↑ "City Development Plan—Kochi" (PDF). Jawaharlal Nehru National Urban Renewal Mission. मूल (PDF) से 29 May 2008 को पुरालेखित. अभिगमन तिथि 20 March 2008. ↑ "TABLE-1.6" (PDF). अभिगमन तिथि 14 October 2010. ↑ अ आ "IPC crime rate in Mega Cities: Table Table-2 (A), page-44" (PDF). अभिगमन तिथि 9 March 2011. ↑ "Crime rate high in Kochi". Metrovaartha.com. 29 March 2010. अभिगमन तिथि 14 October 2010. ↑ "Kochi no crime capital, says police chief". CNN-IBN. 1 November 2011. अभिगमन तिथि 2 December 2012. ↑ "Kochi is safest in Kerala for women". AsianAge. 9 October 2012. अभिगमन तिथि 21 January 2013. ↑ "Liveability Index 2011, The Best Cities In India" (PDF). CII/Institute of Competitiveness. अभिगमन तिथि 11 July 2012. ↑ "Top 10 affluent Indian cities ranked". Nielsen Company. अभिगमन तिथि 4 November 2010. ↑ Sudha Nambudiri (19 April 2011). "Kochi, the new medical hub". Kochi, the new medical hub. अभिगमन तिथि 19 March 2013. ↑ Babu K Peter (26 September 2011). "Kochi set to be hub of plush hospitals". CNN-IBN. अभिगमन तिथि 19 March 2013. ↑ "Gift of life". The Hindu. 21 December 2004. ↑ "Top Angioplasty Surgery Hospital In Kerala, India, Coronary Artery Bypass Surgery Asia". अभिगमन तिथि 5 April 2015. ↑ "Medical Trust Hospital". अभिगमन तिथि 5 April 2015. ↑ "Best IVF, Surrogacy and Infertility treatment clinic in India". Bourn hall IVF clinic. अभिगमन तिथि 5 April 2015. ↑ T S Sudhir (29 April 2006). 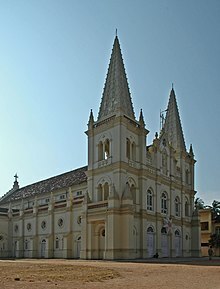 "Kochi's 'mini-India'". NDTV. अभिगमन तिथि 23 May 2006. ↑ "Konkani Akademi Library". University of Chicago. अभिगमन तिथि 1 March 2011. ↑ "Konkanis in Kochi". The Hindu. 13 August 2009. अभिगमन तिथि 1 March 2011. ↑ "Bengalis celebrate Durga Puja". The Hindu. 19 October 2007. अभिगमन तिथि 1 March 2011. ↑ "arts, South Asian." Encyclopædia Britannica. Encyclopædia Britannica 2007 Ultimate Reference Suite. ↑ "Sikhs love peace-loving Kochi". The Hindu. अभिगमन तिथि 1 March 2011. ↑ "The Jews, Israel, and India". An Interview with Nathan Katz. Jerusalem Centre for public affairs. अभिगमन तिथि 17 May 2006.